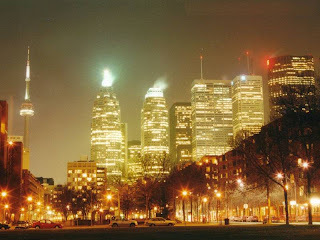 Now, that is why I like Toronto: small enough to get by, big enough to shine like a star during the night... After parking my "shiny" car, which was incomparably easy to Manhatan, Brooklyn, London and even Tel Aviv, I've met with the Professor (no name... right?) and we headed in search for a pub worth our presence. 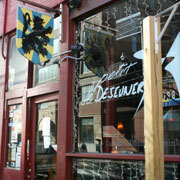 Since we were hungry (for food), we went on in a search for a decent place and that is when we found "Le Petit Déjeuner" located on 191 King Street East. What a gem...! It is a small place (when you compare it to the typical sport bar) but with such an ambiance - high ceilings, exposed brick and soothing red and brown colours. The cafe is run by a (very friendly) Belgium owner with whom we had a lengthy chat, and it serves a good selection of European and local beers and excellent food (my mussels were fantastic). From there (it was after 11PM), we headed back to Union Station when P.J. O'Brient got our attention. It is an Irib pub located on 39 Colborne Street, a small alley between King Street and Wellington Street, and boy... they know how to have fun! There was a live band playing Irish tunes, tough bartender (the one that has a baseball bat under the counter), a huge selection of Irish, European and local beers on a tap and a lot of good looking (all Irish) people having fun (dancing, singing, etc).